In its new edition, Germany's Der Spiegel magazine reported Friday that Italy and France would object to installing Bundesbank chief Jens Weidmann as head of the European Central Bank after the end of Mario Draghi's term in 2019. It said government representatives from both nations had told German Finance Minister Wolfgang Schäuble that they had nothing against a German at the helm of the ECB, "but it must not be Jens Weidmann." The report elaborated that southern eurozone nations feared current pragmatic and flexible crisis management measures such as the ECB's huge bond-buying program as carried out under Draghi would no longer be possible under Weidmann. While Schäuble said in May he would not take part in any debate about Draghi's successor, numerous media reports had highlighted his and German Chancellor Angela Merkel's likely push for Weidmann to become the fourth guardian of the euro currency, after a representative from the Netherlands, France and Italy. But there may be a whole bunch of contenders for the job of ECB president, among them Bank of France Governor Francois Villeroy de Galhau. It cannot be taken for granted, though, that the fight for the post will include Jens Weidmann at all. 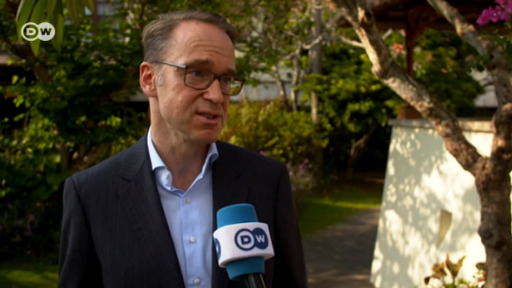 A spokesman for the Bundesbank on Friday quoted him as saying he enjoyed his current job and would certainly stand ready for another term beginning May 2019, should he be asked to do so. Weidmann has headed the German central bank since 2011. After several decades in which the independence of central banks was seen as essential to economic stability, the notion is being questioned again. So are central banks free spirits? And do they truly need to be?